I just love this photo so I have to share it with all of you. This is Master JET at the Musee d'Orsay on our trip to Paris. In general - he wasn't that thrilled to be dragged through the Louvre or the Musee d'Orsay but from time to time there was a piece of art that caught his eye. I figure this is a good thing in that he was actually looking at the art and maybe some day will have an appreication for it. 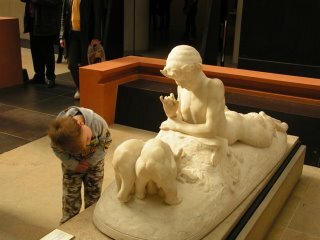 This sculpture was of two little bears sniffing something with a mythical creature looking over them. Look how he is studying the bears closely with his hands politely together. It just makes me smile every time I see it! It was also amazing how he managed to find fish everywhere. He loves fish and loves dolphins and whales. We'd be walking through a museum and he'd yell - FISHY! Sure enough there would be a painting or carving with a fish somewhere. When he did it in Versaille I thought he was just babbling but then I looked up at the ceiling and there was a painting of someone riding a big fish. It was amazing that he was noticing things that we weren't. I guess that's what they mean by experiencing the world through a child's eye! TODAY'S QUESTION: What is your absolute favorite knitting blog to read?